Nine months ago, Vizio didn't make laptops. Now, it's seemingly all our readers are writing in about. The company, best known for its value-priced TVs, is expanding into the PC market, with a collection of all-in-ones and thin-and-light notebooks. So why have we been getting so many emails asking when the heck we're going to publish a review? After all, it's not like shoppers have any shortage of choice when it comes to Windows computers. The answer: Vizio is taking the same approach with PCs that it does with televisions, which is to say it's offering impressive specs while undercutting its competitors. Case in point: all of Vizio's laptops have a full-metal design, solid-state drive, zero bloatware and a minimum screen resolution of 1,600 x 900. And yes, that even applies to the lowest-end notebook, which goes for $900. Can you see now where this would be a tempting deal for folks who'd like to avoid spending $1,100-plus on an Ultrabook? Well, for those of you who've been curious, we've been testing Vizio's 14-inch Thin + Light, and are now ready to unleash that review you've been waiting for. Meet us past the break to see if this rookie computer is as good as it looks on paper. Vizio's first laptop offers fast performance and zero bloatware in an attractive package, but it's marred by some serious usability flaws. How would you rate the Thin + Light 14-inch? Vizio got a lot right on its first try. For a company just entering the PC market, Vizio got a lot right on its first try. For starters, its Thin + Light notebooks are fashioned almost completely out of aluminum -- even on the bottom side, an area where other laptop makers often settle for plastic. What's more, that bottom surface has a rubbery, soft-touch coating that makes it comfortable to hold, and comfortable to rest on your legs (hey, it's shorts season). In general, too, Vizio went easy on the garish embellishments and used just a handful of subtle flourishes to give the laptop some personality. 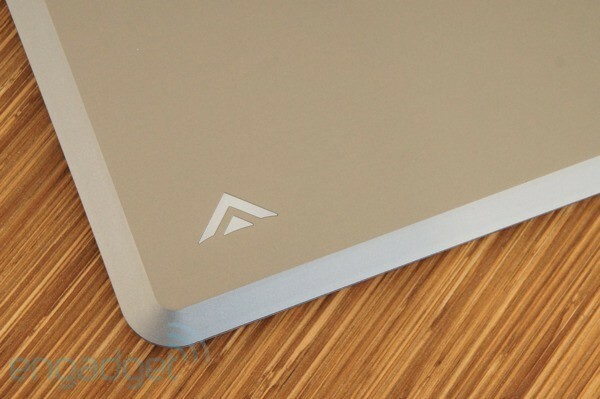 These include beveled edges on the lid and chassis, a glowing Vizio logo on the cover and a power adapter that glows green or orange, depending on the charging status. Pick it up and the system feels about as nice as it looks. There isn't any creak or hollowness in the palm rest, and when you set the laptop down, the lid doesn't wobble, as is the case with other notebooks we've tested. 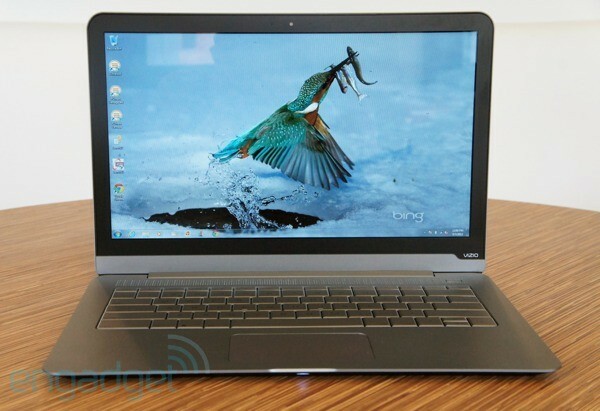 At 3.39 pounds, it's also fairly light, at least as far as 14-inch Ultrabooks go. (This might be a good time to clarify that Vizio is calling this a thin-and-light and not an Ultrabook, but if all we're talking about are thin, portable machines, then tomato, tomahto.) Our only request would have been for Vizio to squeeze a few more ports into the 0.67-inch-thick frame. On board, you'll find two USB 3.0 sockets, HDMI-out and a 3.5mm headphone jack. That's a good start, but on a machine this size we would've expected to see a few – namely, an Ethernet jack and an SD card reader. It's at this point that perhaps Vizio got carried away in its attempts to reinvent the PC. 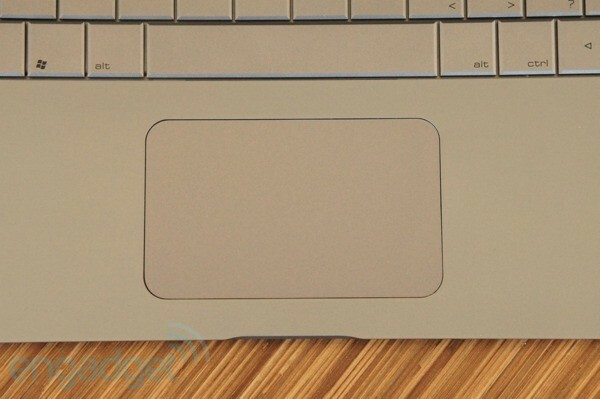 The Thin + Light's keyboard is an odd specimen, with flat-top keys that almost blend into one another. Were it not for some slight beveling between the keys, you'd have a hard time telling one key from the other without looking down at your fingers. Indeed, it took us a day or so to master the cramped layout, but eventually we started noticing fewer errors in our typing. Still, even once we got the hang of it, we noticed that the keys didn't always register our presses. We had this problem with the space bar a few times, and also with the arrow keys (it doesn't help that the up and down ones are especially tiny). If there's one saving grace, though, it's that the Enter, Backspace and Shift keys are pretty oversized, so it's at least easy to hit those buttons square on the nose. Hardly a dealbreaker, but it's worth noting that these keys aren't backlit. According to Vizio reps, the engineers were concerned that a backlit keyboard would increase the thickness of the laptop, and most backlit keyboard suffer from unsightly light bleed anyway. That said, the company is apparently considering backlighting for future models. The Thin + Light's touchpad is a little small compared to what you'll find on other modern laptops, but it's still sufficient for two-fingered scrolling and pinch-to-zoom. The problem is, the pad just doesn't work very reliably, even after some early driver updates. For one, the touchpad offers a good deal of resistance, and moving the cursor where you want it to go can be a challenge: sometimes it stops short on the screen, and occasionally it moves in a different direction entirely. There were a few vexing instances in which the cursor randomly jumped to a different part of the screen while we were typing, forcing us to backtrack and delete unwanted characters before carrying on. At other times, too, the pad mistook left clicks for right ones. For what it's worth, Vizio reps seem aware of the Thin + Light's early trackpad issues and promise a driver update is coming sometime in the next few weeks. Still, the pad is frustrating enough to use as is that we can't see ourselves giving this laptop a hearty recommendation until Vizio figures it out. The amazing thing about using the Vizio Thin + Light for the first time is that if you thought you resigned yourself to a garden-variety 1,366 x 768 display, you'd think this was the best HD display you'd ever seen. In fact, Vizio's engineers were apparently as disgusted by these lower-resolution screens as you guys were, and decided that at the very least, its laptops would have a 1,600 x 900 pixel count. (The higher-end configurations have 1080p panels.) And while we've tested many a 1,366 x 768 laptop and survived, you really can tell the difference here. This is much crisper than what you'd typically get at this, or any price. Just keep in mind that because this is a typical TN panel, the viewing angles aren't that special. (Note that Vizio's 15-inch Thin + Light does have an IPS panel.) Depending on how harshly lit your surroundings are, you could probably get away with crowding around the laptop and watching a movie from friends, even if it meant one of you would have to watch at an off-angle. Naturally, the whites are a little less white from the sides, but it's still easy enough to make out whatever's on screen. You'll have a little less luck if you dip the screen forward, though: we even found it difficult to type this review unless the screen was positioned at an upright angle. We'll say this about the sound: the volume is appreciably loud. 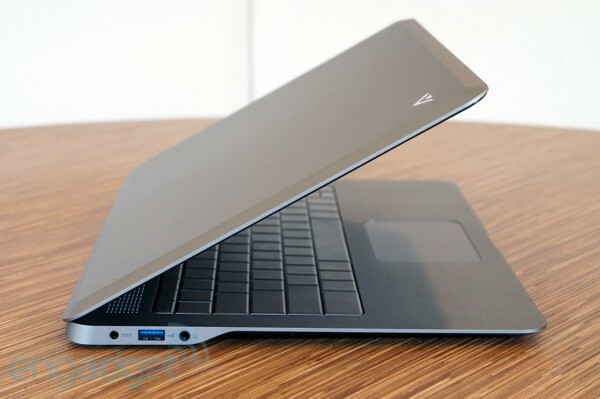 It's louder, certainly, than the ASUS Zenbook Prime UX31A, which we happened to be testing at the same time. As for quality, though, the sound is almost indistinguishable from other laptops, which is to say it's tinny and constrained, but probably good enough for a listening party of one. For the purposes of this review, we tested Vizio's top-of-the-line configuration, with a 1.9GHz Core i7 processor, Intel HD 4000 graphics, 4GB of RAM and a 256GB SSD made by Toshiba. Particularly since we don't test many Core i7 Ultrabooks around here, it's not surprising that the Thin + Light delivers some of the fastest performance we've seen. Its score of 13,525 in PCMark Vantage is actually the highest we've seen in this class of computer, though it does seem a bit peculiar that it's almost the same score we got from a Core i5-powered MacBook Air. We would have expected the delta to be even bigger, any differences in SSDs notwithstanding. Still, we'll never complain about this kind of performance, which includes 553 MB/s read speeds, 530 MB/s writes and an 18-second startup time. Graphics-wise, the Thin + Light scored 5,443 in 3DMark06, which is at the high end of what we've been seeing from Ivy Bridge laptops with integrated graphics. Still, without a discrete GPU, even the best Ivy Bridge machines struggle with gaming -- this guy couldn't even break 30 frames per second in Call of Duty 4, and that was with the default settings (1,024 x 768 resolution). Oh dear. It's never a good thing when a company promises its 14-inch laptop will last five and a half hours, tops. Indeed, the Thin + Light didn't make it nearly that long in our video rundown test, dying out after less than four hours. Granted, our particular battery life test is taxing, much more so than the MobileMark benchmark Vizio uses in its testing labs. Still, pretty much every 14-inch Ultrabook we've tested, from the HP Envy 14 Spectre to the Samsung Series 5 to the Acer Aspire M5, has lasted five hours, if not more. Suffice to say, that's not acceptable for a product that was built to be mobile, and that should have room for a larger battery. Even more than that high-resolution display or all-metal chassis, this is how Vizio decided to one-up all those seasoned laptop makers. Every unit ships with Signature, a clean, crapware-free image of Windows that was approved by Microsoft (and obviously Microsoft doesn't want Windows to be known for its bloat, so it has a clear motivation to keep the junk out). Indeed, you won't find any third-party software other than Adobe Reader. Other than that, it's Microsoft Office Starter edition, which you'll find on every copy of Windows; Microsoft Security Essentials; and Skype, which is, of course, now a part of the Microsoft family as well. Naturally, even if there were a long list of third-party programs, we could've uninstalled each and every one of them. But there's something to be said for booting up a computer for the first time and loading up a near-blank desktop. It makes you wonder when Dell and HP and Acer and every other PC maker will get with the program. There is one unorthodox thing about Vizio's PCs, and that's that you can use a function key -- excuse us, the V-Key -- to launch certain multimedia sites, such as Netflix or Amazon Instant Video. That key is actually just the F1 button with Vizio's logo painted on it, and when you hit it for the first time you'll be taken to a browser-based setup. (See? Even Vizio's own application doesn't eat up precious megabytes on your hard drive.) All told, it's a harmless little gimmick, but it's also not terribly useful. It would seem that Vizio wanted to tie in these streaming services as a way of calling attention to its TV know-how, but if you ask us, the company already did that by including such a lovely display. The Thin + Light has a one-year warranty, which is typical for a consumer PC, regardless of the price. Though the unit we tested would cost you $1,200 if you were to buy it off Vizio's website, the laptop actually starts at $900, with a Core i3 processor, four gigs of RAM and a 128GB SSD. For $950, you get a Core i5 CPU instead, but otherwise the specs are the same. That means if you want 256GB of storage, the $1,200 Core i7 model is your only option. Regardless of which one you pick, you'll get a 1,600 x 900 screen and Intel's HD 4000 graphics. It's a similar deal for the 15.6-inch Thin + Light, which starts at $950 and goes up to $1,250. Here, too, there's a Core i3, i5 and i7 configuration, and you'll need to go with the highest-end model to get those 256 gigs of storage. In the case of these 15-inch machines, though, the screen resolution is 1,920 x 1,080, not 1,600 x 900. We're hesitant to recommend the Thin + Light series based solely on looks, price or specs. A laptop with an all-metal design, SSD and a 1,600 x 900 screen begs comparison with other high-end thin-and-lights, don'tcha think? Spec-wise, at least, the Thin + Light is aggressively priced. Whereas the Core i5 version costs $950, for instance, the ASUS UX31A with a Core i5 CPU and 128GB SSD goes for about $1,100. Still, specs aren't everything, are they? Having tested both laptops, we can say that even though the UX31A also suffers from trackpad issues, it does have a more comfortable keyboard, and also lasts longer on a charge. Meanwhile, the performance is similar, the design is equally sharp and the IPS screen has a higher resolution, so there's an argument to be made that there's an upside to paying $150 more for it. 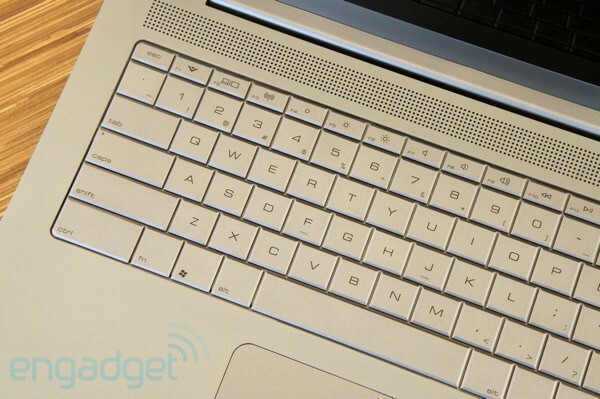 Ditto for the MacBook Air, which costs $200 more, but offers a superior keyboard, trackpad and battery life. Sure, the pixel count is 1,440 x 900, but as we've tried to demonstrate, a higher-res screen isn't much consolation when the computer has some serious usability flaws. We wanted to love Vizio's underdog first laptop, and we did when we first took it out of the box. Despite having never made a PC before, the company managed to put out something truly beautiful, with a sharp screen, solid build quality, fast performance and a completely clean version of Windows. We applaud the implicit challenge to the HPs and Dells of the industry, which have gotten sloppy with some of their designs, and still load up computers with bloatware, thinking consumers won't put up a fight. Unfortunately, though, Vizio still has a good deal to learn about building PCs, and its inexperience shows in the jumpy trackpad, uncomfortable keyboard and wretchedly short battery life. We suspect the company will have plenty of fodder when it returns to the drawing board to plan its next generation of laptops. For now, though, we're hesitant to recommend the Thin + Light series based solely on looks, price or specs -- after all, a $900 MSRP doesn't make this thing any easier to use.